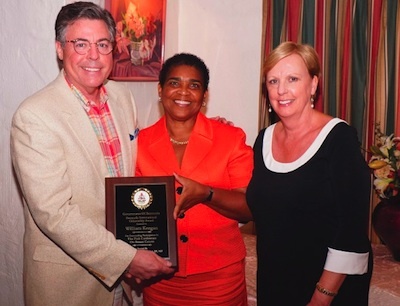 News and Events | Capital Formation Marketing, Inc.
William Keegan, Minister of Health, Patricia Gordon-Pamplin, Diane Keegan Bill Keegan, President and CEO of Innovative Medical Conferences, LLC, was the recipient of the Bermuda International Citizenship Award granted by Bermuda’s Premier Craig Cannonier for his production of the “Pink Conference On Breast Cancer.” Bill Keegan, together with Dr. Francis Arena, a renowned New York Oncologist from NYU Langone, brought together seven leading cancer specialists from Memorial Sloan Kettering, Weill Cornell, NYU Langone and NorthShore LIJ to participate in a pubic forum on breast cancer held on July 9th at the Earl Cameron Theater in Hamilton, Bermuda. In addition to the public forum, the doctors were invited to participate in a Continual Medical Education course (CLE) at Bermuda’s King Edward Memorial Hospital. The Mayor of Hamilton, Graeme Outerbridge held a press conference on the afternoon of July 8th at Hamilton’s City Hall to introduce the visiting doctors to the Bermuda press. Minister of Health, Patricia Gordon-Pamplin spoke with the press about Bermuda’s high rate of breast cancer per capita than normal populations and that women have to go off Island to receive treatment for radiation or reconstruction surgery. Bermuda Cancer and Health Centre and King Edward Memorial Hospital collaborated with Bill Keegan and Innovative Medical Conferences to help make the public forum an important Bermuda event. The Pink Conference on Breast Cancer received full coverage by Bermuda TV, print and media. The Mayor later sponsored a cocktail reception at City Hall for the visiting doctors and Bermuda dignitaries. Bill Keegan is also President and CEO of Capital Formation Marketing, Inc., an international public relations and investor relations company. In collaboration with Victor Webb of Marston Webb International, they have been representing Bermuda’s Ministry of Finance, Minister of Business Development and Tourism, Bermuda Stock Exchange and the City of Hamilton to help promote Bermuda as an important international financial center as well as drive inward investment.